Badly in need of some wins to string together there might not be a better place to start then Athens, Georgia for the Gators as they take on a Bulldogs team that has lost to Tennessee by 46 points (not a typo, actually 46 points) and even lost to Georgia State of the Sun Belt conference by 24. Under the new coaching regime of freshly hired Tom Crean it’s a program going through a transition period and the Gators are going to need to capitalize on a team that’s coming off a tough 20-point loss to Kentucky if they’re going to get the season back on track. Sitting at 1-3 in the SEC the Gators can ill-afford a loss to a lowly Georgia team and with winnable games like Texas A&M and TCU coming soon-after this could be a confidence-building game that helps them start working towards an NCAA Tournament resume. Here is everything you need to know before Saturday’s matchup. Georgia wasn’t a great team last year but it didn’t stop them from beating the Gators in both matchups last season, one by 12 points in Georgia and the other being a heartbreaking 3-point edge in Gainesville. Luckily for the Gators the two players that torched them graduated last spring including dominant center Yante Maten (20 and 7 in the first game and 23 and 10 in the second) and a guard in Juwan Parker who limited Chris Chiozza to 2-14 shooting in Gainesville. Eliminating those two talents from the matchup should swing things back in Florida’s favor but the fact that many of the Georgia players have tasted Gator blood they might be playing with an extra dose of confidence when Florida comes into town. It also should be noted that despite Jalen Hudson’s outstanding season a year ago Georgia was not good to him as he went 3-14 from the field in one game and in the other put up 0 points in 19 minutes, perhaps foreshadowing the struggles he was going to have this season. Even with Yante Maten graduating it’s still the frontcourt that’s the cornerstone of Georgia basketball with Rayshaun Hammonds (13.7 points, 6.5 rebounds) and Nicolas Claxton (12.6 points, 9.4 rebounds, 3.3 blocks) leading the way. Without a lot of difference makers on the outside the Bulldogs are committed to pounding the ball into the paint and sending lots of bodies to the offensive glass. 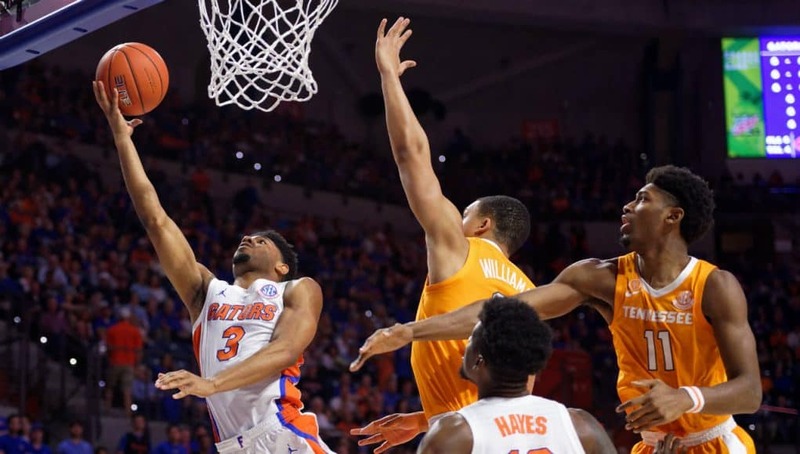 The tireless work ethic of Claxton and Hammonds could provide issues as they try to keep possessions alive and the Gators will have to find a box out on them after every shot. When one of those guys needs a break the powerfully framed Derek Ogbeide enters the game and he might even be more physical than the starters. He gave the Gators trouble in the second matchup of the season last year and he’ll be another big body to worry about. Grabbing offensive rebounds on 32.4% of possessions, second-chance opportunities are of major importance to Coach Crean’s Bulldogs and if the Gators can limit those extra possessions Georgia should have trouble putting points on the board. When you start looking at some of the defensive metrics for Georgia you see some impressive things. They’re 20th in defensive effective field goal percentage, 55th in 3-point percentage allowed, and 22nd in 2-point percentage allowed. 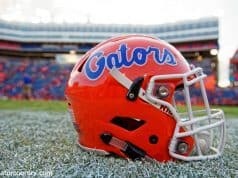 In all of those categories they are better than the Gators. Seeing those you would think this would be an above-average defensive team. However, they’ve actually struggled and allowed a lot of mediocre teams to put a lot of points up on them and it’s resulted in them being 82nd in KenPom’s adjusted defensive efficiency metric. Playing a bigger lineup has resulted in some lapses in their perimeter defense and that will be something the Gators need to try and exploit. After really struggling to get the ball moving towards the hoop to start the season the Gators have seen improvement in that area utilizing back screens off the ball to get cutters to the hoop, an offense that was fruitful against Mississippi State in the first half. If they do get to the hoop they’ll be met by an excellent shot blocker in Nicolas Claxton. A fast-twitch athlete with a quick leap to get to shots his 3.3 blocks per game speaks to how good of a rim protector he is and the Gators will have to be aware of his presence in the paint. 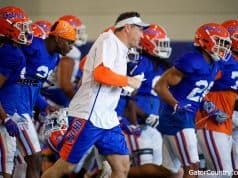 I know the Gators’ offense is still a work in progress but they are making steps in a positive direction. They were able to hit shots against Tennessee and then get layups in the first half against Mississippi State, and even though they took losses they actually improved after each game in KenPom’s offensive efficiency stat. If they don’t start winning games soon it might be too little too late but there does seem to be improvement offensively. Florida’s redshirt-freshman big hasn’t seen the floor in the last few games and though I’m not sure Coach White is in a hurry to get him back in the mix there could be a nice matchup for him against Derek Ogbeide. Ogbeide has a similar frame and plays close to the hoop, giving Stokes a similar matchup in skillset he hasn’t had recently. White said conditioning was the reason Stokes has been struggling to stay in the rotation and I don’t think that problem could have been remedied in the last week but perhaps this is a game White gives him another chance. Solid minutes from Bassett has also contributed to less minutes being available for Stokes and his improved play is definitely worthy of a shout-out as his game has made strides since last season. After playing his season high in minutes against Mississippi State while also dialing up 3 3-pointers I think Keyontae Johnson made a loud statement about why he should be starting for this team. His ability to make effort plays with his athleticism and the physical tools he has to beat opposing power forwards off the dribble makes him a valuable player and I wouldn’t be surprised if he starts against Georgia. Adding to the situation is the fact that the two players who have started at the “4” this year have both struggled with Keith Stone having 0 points in 3 of the first 4 SEC games and Jalen Hudson continuing to struggle to hit shots. Johnson starting is something I have been in favor of and I think the Georgia game could see him getting the nod. After the most recent update to the NCAA’s own ranking tool the NET ranking the Gators are, wait for it… 42nd. Not awesome. Right ahead of Murray State and right behind Washington. It should be noted that they are the highest rated single-digit win team at 9-7 with the next highest being Oklahoma State at 68. That really puts into perspective how good close this team is to being really good, as a couple of these one-possession games in Florida’s favor could put them much higher. Considering their record most metrics still like Florida so if they can string together wins they would be in great shape when it came to an NCAA Tournament resume. This is a game Florida just can’t lose. I know it’s in Athens but at 9-7 on the season and 1-3 in the SEC they can’t afford to drop a game to one of the basement teams in the league. The way Florida was able to get dribble penetration against Mississippi State makes me think they’ll be able to score on Georgia and Georgia doesn’t have the same offensive weapons on the perimeter so the Gators will hopefully have a better fate. 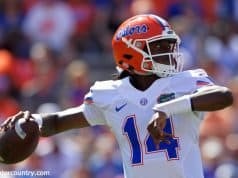 The Gators are going to need to go on a winning streak at some point to turn their season around and Saturday against Georgia will be as good a day as any.